The Big One: Are you prepared? - AM/PM Insurance Agency, Inc.
Home > Blog > The Big One: Are you prepared? There is always a possibility of an earthquake in Southern California, being prepared could help your family stay safe and cause less damage to your home. You never know where you or they will be and having a plan can help everyone focus during such an event. Walk through your home and anchor furniture that might otherwise fall during an earthquake. Secure your water heater, refrigerator, and top heavy items to wall studs. Store heavy items and breakables in lower shelves. Remove toxic or flammable chemicals from your home. Learn how to shut off electricity, gas and water at main fuse box or valve to prevent damage in your home. Create a plan and drill for your family to practice periodically to avoid injury and help them stay calm during an earthquake. Set aside emergency supplies. Here is a link for a list from Be Prepared California. Establish a family reunion plan just in case your family is not together during an earthquake. Teach your family members the phone number to an out-of-area contact so that everyone can have a singular place to contact just in case local phone numbers are not working. If you have children in school, find out what the school emergency policy is. Will the school hold or release your children? Will they only release your child to you or someone you have authorized? 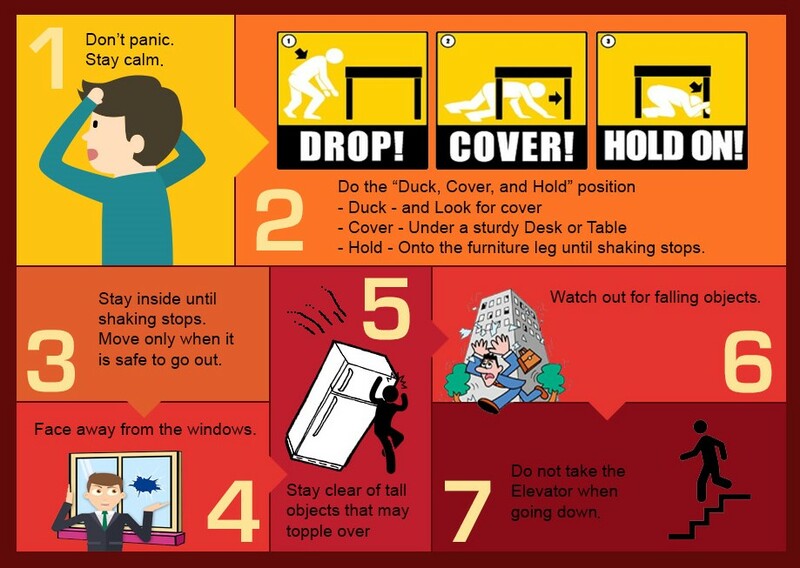 During a quake, stay calm and remain where you are. If you’re in your car, calmly pull over to a safe place and avoid bridges, overpasses, and overhead wires. Turn on your radio and stay in your car until the earthquake is over. If you are inside of a public building, get under a table, huddle against an inside wall, stay away from big windows. Cover your face and head. If you’re in a high rise, be prepared for the building to sway and shift. If you’re outside, stay away from buildings, trees, and power lines. We know it’s easier to say “stay calm” then it is to actually feel calm during such a scary event, but if you practice with your family it will be easier to snap your mind into focus if the time comes. We hope that this was helpful, if you have any questions about your home’s earthquake coverage, call us at (866)424-8782. We’ll answer your questions as best we can or give you a free quote if you need one.